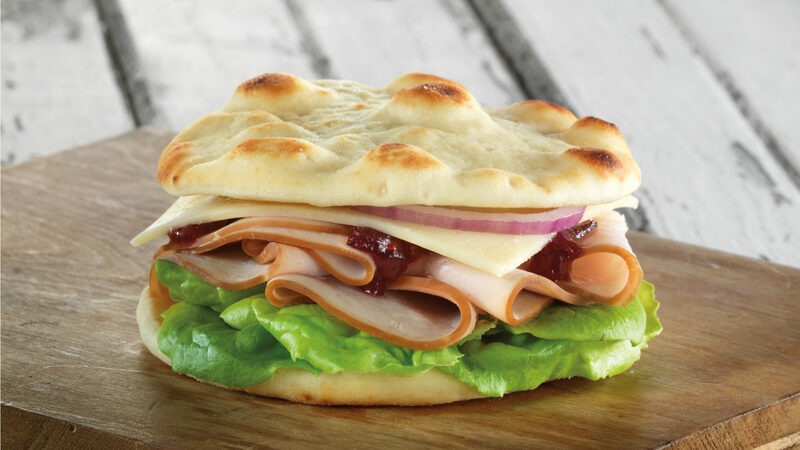 Add a twist to your classic turkey sandwich by using Stonefire® Naan Rounds as a base. With the texture and flavor of original naan in a handheld size, Naan Rounds are the perfect sandwich canvas. This simple flatbread recipe is packed with the flavor of roasted turkey, cheddar cheese and sweet and tangy cranberry sauce. Serve alone for a simple meal or with a side soup or salad. Once warm top 4 Naan Rounds with sliced turkey, sliced onion, lettuce leaf, cheddar cheese and 1 tsp of cranberry sauce.